Spinal Cord Injury is damage to the spinal cord, which is a cylindrical column of central neural tissue that descends from the brain down the spinal canal, from which peripheral nerves arise to deliver signals to every part of the body. Spinal cord injury occurs in about 12,000 people each year in the United States and in over 300,000 people each year in the world, and nearly 300,000 people in the United States are living with a spinal cord injury, along with over 3,000,000 people living with this injury in the world [1-3]. In addition to increased difficulty with activities of daily living, spinal cord injured patients also generally have medical complications involving chronic pain, bowel and bladder dysfunction, ulcers, and infections like pneumonia, urinary tract infections, and skin ulcer infections. Injury to the spinal cord may occur from stretching, contusion, laceration, lack of blood flow (as in a stroke), or even from certain genetic or infectious diseases. The injury may be partial (only affecting some neural function below the lesion) or complete (destroying all neural function below the lesion). In traumatic injuries vertebrae are typically fractured or displaced, exerting compressive, tensile, and shear forces on the spinal cord tissue, and vascular injury (including hemorrhage or thrombosis) can further worsen the injury. Symptoms generally include paralysis, weakness, loss of sensation, and disturbances of autonomic function (such as that involving blood pressure, bowel and bladder function, or sexual function). 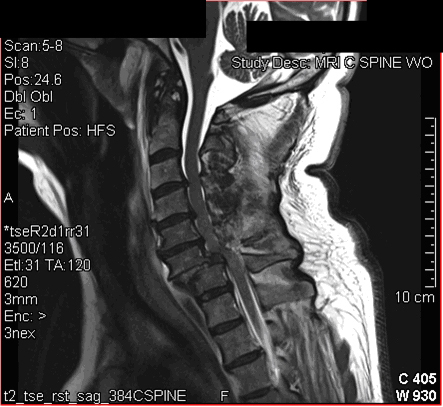 Some temporary spinal incapacitation can result from swelling and inflammation after an acute injury, while additional neural death may also result from excitotoxicity, swelling, inflammation, and secondary messenger cascades after an injury, and therefore time is needed to assess the full extent and outcome of the injury. After time, glial scarring, demyelination, and cyst formation may also occur in the neural tissue. Efforts to find neuroprotective agents that can prevent further cell death and damage after the primary injury have been promising, but as of yet no drugs have been proven clincally effective for this approach in humans. Research is also underway to find innovative and useful therapeutic interventions that will improve or cure spinal cord injury, and, in particular, neural tissue engineering holds much potential to restore function to these patients. This includes unique and innovative efforts to reconstruct spinal cord pathways using 3-dimensional neural tissue with stem cells, biomaterials, and nanotechnology [4-6]. 1) National Spinal Cord Injury Statistical Center. Spinal cord injury facts and figures at a glance. J Spinal Cord Med. 36(1), 1, 2013. 2) Jackson AB, Dijkers M, Devivo MJ, Poczatek RB. A demographic profile of new traumatic spinal cord injuries: change and stability over 30 years. Arch Phys Med Rehabil. 85(11), 1740, 2004. 3) Wyndaele M, Wyndaele JJ. Incidence, prevalence and epidemiology of spinal cord injury: what learns a worldwide literature survey? Spinal Cord. 44(9), 523, 2006. 4) McMurtrey RJ. Patterned and Functionalized Nanofiber Scaffolds in 3-Dimensional Hydrogel Constructs Enhance Neurite Outgrowth and Directional Control. J. Neural Eng. 11 (2014) 066009 . 6) McMurtrey RJ. Analytic Models of Oxygen and Nutrient Diffusion, Metabolism Dynamics, and Architecture Optimization in Three-Dimensional Tissue Constructs with Applications and Insights in Cerebral Organoids. Tissue Engineering Part C. 2015.